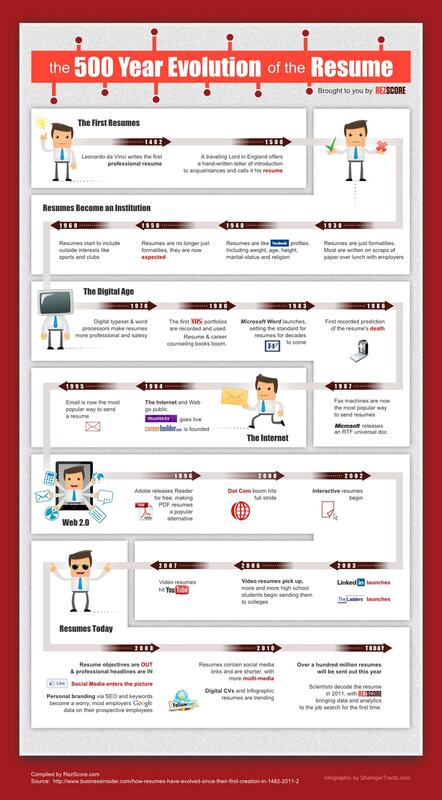 This infographic, created by Rezcore, shows the 500-year history of the resume. Leonardo da Vinci wrote the first professional resume in 1482. Between 1930 and 1960, resumes went from being on scraps of paper to being expected – an institution. In the 1980s, VHS resumes were used! In 1983, Microsoft Word was launched – creating a new template for resumes. Video resumes hit YouTube in 2007.